We are excited to announce that we are on our 4th year of having a Crown Club! We are looking forward to working with high school girls and imparting to them all of the great benefits of being a volunteer and a leader in our community. Crown Club will be like a "mini JA"--they will have monthly meetings of their own (with us there serving as Crown Club Advisors), officers, and one service project of their own. They will also help us with all our service projects and will have a required number of hours to maintain. In addition, they will have their own constitution, learning about Parliamentary procedure and the art of conducting an effective meeting. Their service hours will help when filling out those college applications. Do you know of an incoming sophomore, junior, or senior that you would like to nominate? There is limited space, so everyone nominated will not be chosen. We would love to hear from you! If you are a high school girl and want to know more then please complete our online form and the Crown Club Advisor will be in touch with you soon. 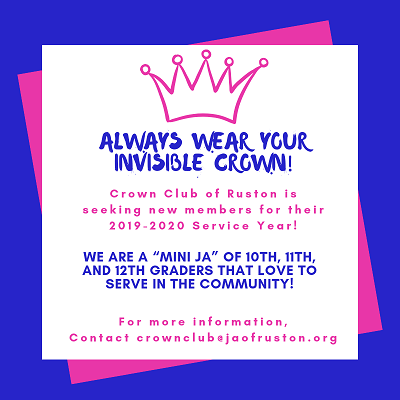 If you know that you would like to join today then please download the Ruston Crown Club Application below!